This was another outfit I put together for the styling event with CS Gems and The Fashion Lane Truck a few weeks back. I absolutely love this top! 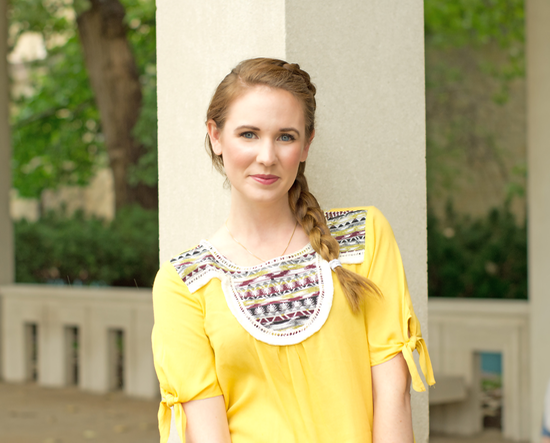 The subtle fringe, patterned yoke, and sleeve ties are all such fun details. I also love that it's definitely got a 'Fall vibe', but is light enough to break out in August or September without dying from the heat. Such a pretty clutch! And how fun to got to NYC to attend the reward style party! love your hair! perfect pre fall outfit!thank you for hosting this link up! you look so cute, love this top. I'm sure you will find something fabulous to wear at the party. You guys are going to the RewardStyle party!? I got the invite, but decided I can't swing it. NOW I want to go. I'm only 2 hours away here in Philly. Seems a shame not to go but I didn't think I'd know anyone. Now I'm conflicted. I can't wait to see your pictures from it!!!!! I love this bold top and this bag! Beautiful look! Love this top and clutch on you! How fun that you and Caryl are going! You'll have a blast - such a great opportunity. I adore this outfit so much! I swear it's like you knew advance what to bring! Everything is so cohesive and the details are all so fun! 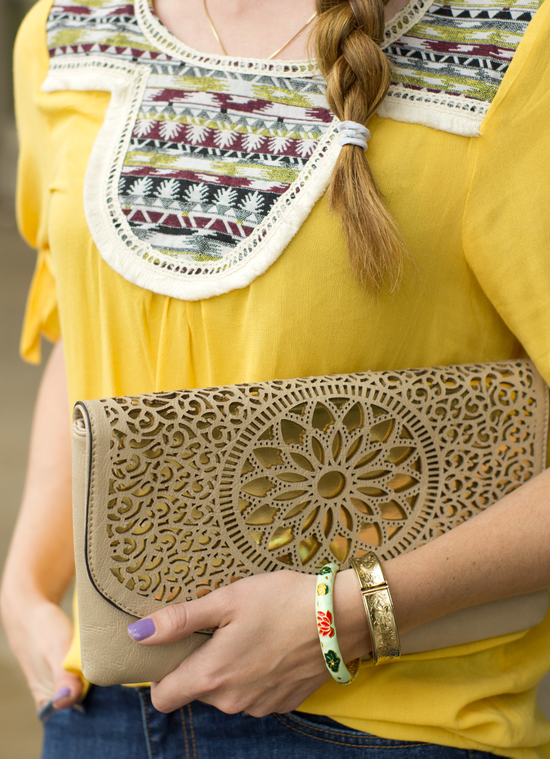 I love that pretty top and the fun clutch! This is such a great look for transitioning to fall. Good luck with the party outfit--can't wait to see what you end up getting! What a great look! I love that top and bag. The shoes are pretty cute too! Hello! 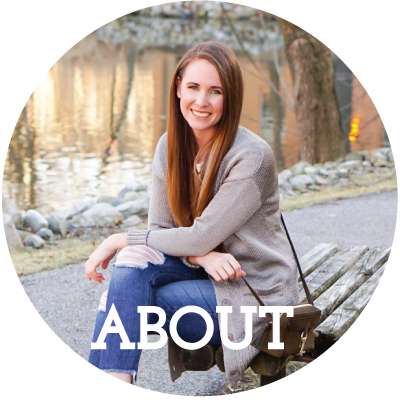 New to your blog via the link up! Loving this mustard color on your. Your hair and clutch are beautiful additionadditions to complete the look! The detailing of that bag is so cute and I love the booties. I can't wait to see what you put together for the reward style party. 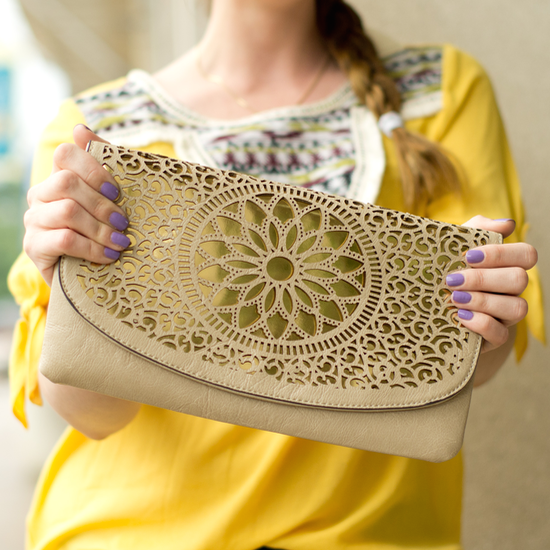 I love the detailing on that clutch! 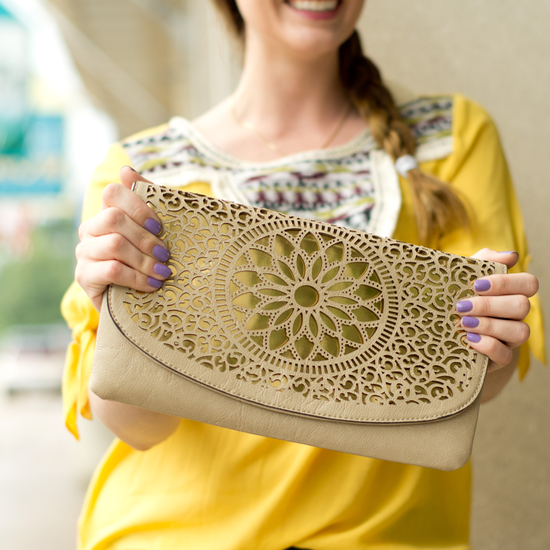 Beautiful clutch, Jenna! I'm sure you will find the perfect outfit for NYFW - you & Caryl are going to have such an amazing time! That top is beautiful! Love all of the details on it. Great clutch too! Gorgeous! I love your hair in these pictures, too! Such a pretty look! You look pretty in yellow. That clutch is gorgeous!! Loving your hair braided like that! 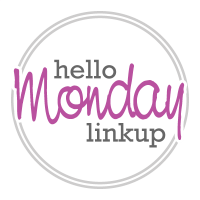 We'd love to see you Link up on our Tuesday Fashion Party link-up! I am having serious hair envy. Love the braids. And the color of that top is so perfect for this time of year. Good luck finding the right outfit for the party.